The decision by Sen. Tom Udall opens up a secure Democratic seat to competition. 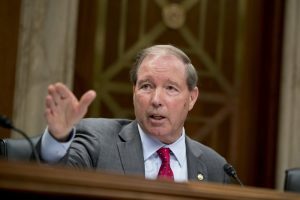 SANTA FE, N.M. — New Mexico Senator Tom Udall announced Monday he will not seek re-election in 2020, opening a secure Democratic seat to competition and ending a chapter in a Western political dynasty built on environmental conservation. In one crowning legislative achievement, Udall ushered through Congress with scant opposition a modernization of outdated chemical safety regulations that were signed by President Barack Obama in 2016. He grew worried that the law would be misused to protect industry under the administration of President Trump. Democratic colleagues in Washington and serving in statewide office rushed to praise Udall for his record on environmental conservation and the protection of public lands – a Udall family trademark – and as an advocate for Native American communities that span New Mexico. It was initially unclear whether Torres Small or two other members of New Mexico’s U.S. House delegation – also Democrats – might compete for Udall’s vacant seat. New Mexico Republicans are scarce in prominent public offices, having been driven out of every stateside elected office in the 2018 elections. Democrats serve as mayor in three of the state’s four largest cities – Albuquerque, Santa Fe and Las Cruces.